I wasn't going to do a "Five Things" today, but I had enough things to write about, so here it is! 1. Last week a lot of my friends were posting a link on Facebook to a new Mormon Messages video called "You Never Know," so I took the time to watch it since it was popular and involved a mom of young kids, something I obviously can relate to. It's good and worth watching. However, I was surprised to find as I watched that some things in the video bugged me. I don't usually feel that way with Mormon Messages because I think they're really well done. Don't get me wrong; I could totally relate to a lot of what was in the video and I appreciate its main message very much. I will even admit that my eyes filled up with tears at the end when President Hinckley's voice came on and he said those wonderful words of wisdom, words that I agree with. I realize that the whole point of the video is "You never know how much good you do," especially when you have a bad day and are tired and dejected by the end of it, and the details shown in the video are really secondary to that. But some of those details bugged me, and I think they point to a bigger problem that many people have, especially women, both in and out of the Mormon church. The mom (I'll refer to her as "the mom" for simplicity's sake) doesn't say "no" to some of the things requested of her, and I think she should have. There's nothing wrong with that--it's not always selfish to say "no." I very much believe that you have to take care of yourself so that you can be happy and healthy and therefore able to take the best care that you can of your family. That's what's most important. This is something I've really been working on in my own life, and I KNOW that it makes a difference and I'm a better and happier mother, wife, and woman for it. It's about trying to live a well-balanced life. It's not about saying no to service opportunities; it's about saying yes to them when it's something you can handle and/or want to handle. This video did not portray that well. Again, that's not the main point of this message, but I still think it matters and is worth talking about. Specifically, there were two things in the video that drove me nuts. The first was the friend who showed up at the mom's doorstep asking last-minute if she could watch her daughter, right then and there. First of all, who does that? Secondly, the friend could clearly see that the mom was on her way out the door and that it wasn't a good time for her, but she left her daughter with her anyway, and only said "Thank you" when she picked her up later and quickly left. I found the whole scenario to not be very believable. The mom should have said, "I'm sorry, I can't do it," or she could have taken the girl along on her errands, since she had her own daughter with her anyway, instead of staying home and not going out to do what she was planning on doing. I thought it was rude of the woman to just show up and put her on the spot like that. Later in the video you see that it was an important doctor's appointment that may have been a last-minute emergency, and it really did help her to be able to have that time with her doctor and husband, but I'm not sure that it dismisses being so inconsiderate without much explanation. So that whole scene bothered me. The other thing that bugged me was when someone called to see if the mom could bring dinner over that night to a family who had a new baby. The mom had plans that evening to see a cousin who was in town just for a short while. She should have just said "no." It was a last-minute request, she had her own kids to feed and care for, she needed to get ready to go out, and she would have been perfectly justified in saying that she couldn't do it that night. OR, she could have ordered the family a pizza instead of making them a homecooked meal, which resulted in her missing getting together with her cousin that night and caused her to be frustrated with the kids and discouraged with everything at the end of the day. That is not healthy self-care. Granted, it was partly her own fault for forgetting that she had agreed to provide the dinner until the last minute. But if she'd been better organized that probably wouldn't have happened. Lack of organization like that can be another sign of lack of self-care. OR she could have put the meatloaf or casserole or whatever it was together and brought it over uncooked and they could have easily popped it in the oven themselves. Nothing wrong with that! You can still have a bad day even when you do take care of yourself and your family's needs first, you can still feel like a failure at the end of the day and be short-tempered with your family, your efforts at giving service might not go very well, but you still don't know the good that you may have done that day. Having said all that, I want to reiterate that I really do like the main message that the video sends. I wouldn't have teared up at the end if it hadn't touched me and spoken to me in some way. 2. Speaking of self-care...I started blow-drying and styling my hair this week, after years of not doing it because of the tragic (seriously, tragic) damage that my hair has been dealing with after those botched highlights I got four years ago. Heat styling was just making it even more dry and damaged, so I've hardly done it over the past four years. But my hair seems to have finally gotten over it and is a lot healthier now. It's ready to move on to the next step. Yeah!! It desperately needs the volume and style that blow-drying gives it. I don't think it's ever going to grow any longer than my shoulders again, but that's okay. I can live with that, and I like shorter hair anyway. I can also live without highlights and hair dye. I'm happy with my natural blond color, especially in summer when it lightens up and gets some nice sun-kissed highlights. I can be happy with healthy hair that looks good enough. It doesn't have to be the best hair in the room (it's never been the best hair in the room!). Anyway, I'm not going to blow-dry every day because I don't want to over-do it and my hair air-dries quickly anyway because it's so thin, but on the days that I do blow-dry, I use this Pantene Overnight Miracle serum at night, and it seems to really help repair or prevent damage. I also like John Frieda's Luxurious Volume Fine to Full Blow-Out Spray. I hope this fascinating hair news added something special to your day in some way. Ha ha. 3. 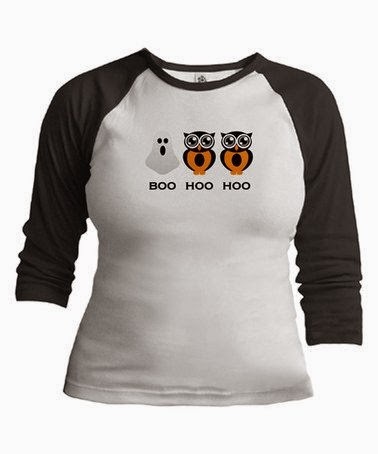 I couldn't resist getting this cute Halloween shirt that I saw on Zulily this week. It's a good thing I got it when I did because it ended up completely selling out! Now isn't that just the cutest? I mean, cu-hootest? 4. We're having a beautiful Iowa fall! Summer will always be my favorite, but when the temperatures are mild and the foliage is turning colors and the sky is a beautiful blue, it helps ease the transition between seasons beautifully (literally). I picked out the first pumpkin for the front stoop yesterday and I'm looking forward to filling the porch steps with them in the weeks to come. It really is a nice time of year!